At the heart of Liverpool’s St George’s Quarter and directly opposite Lime Street Station, St George’s Hall is a breathtaking venue. St George’s Hall is widely regarded as one of the finest neo-classical buildings in the world and is a Grade I listed building. Prince Charles reopened it in 2007 after a £23m refurbishment programme. Built in the early 1800s as a space for music festivals and the Civil and Crown courts, the hall has always been at the heart of community life in the city. There are plenty of hotel within walking distance of St George’s Hall. The Liverpool Marriott Hotel is the designated conference hotel. For all other accommodation reservations see below. Liverpool is hosting the International Festival of Business in June and July 2014 (http://www.ifb2014.com/), which means over 250,000 additional visitors to the city. We recommend that you book your accommodation as early as possible. This year we have teamed up with Liverpool’s Convention Bureau, which has negotiated deals with a variety of hotels within walking distance of St George’s Hall. The prices quoted are for bed and breakfast single occupancy. The room allocation expries on 28th April (6 weeks before the date of the conference). We encourage delegates to book early to guarantee the best choice as cancellation terms are very flexible, meaning you can generally book a room without paying a deposit (although card details will be taken to guarantee the room in case of no shows) and cancel it up until the day before arrival without a penalty. The booking site locks down 1 week before the meeting. Please note that we are aware that websites such as laterooms etc may offer cheaper last minute rates, however, you are taking a risk that all accommodation may be fully booked. Situated in the centre of Liverpool, Adagio Liverpool City Centre is nestled between Liverpool Central railway station and Clayton Square Shopping Centre in an iconic Grade II listed building. 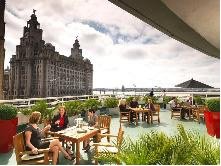 The Atlantic Tower by Thistle is an award winning deluxe 4 star hotel located opposite the World famous Liver Buildings and the historic waterfront and is within a ten minute walk to the BT Convention Centre along the beautiful UNESCO World Heritage waterfront. Bridgestreet Liverpool ONE 4 Star Serviced Apartments offers a stylish choice of One, Two and Three bedroom Apartments. A perfect hotel alternative for the discerning conference delegate looking for a luxury value for money option. The 87-bedroom upscale and full-service hotel boasts a central location in Liverpool city centre. The Grade II-listed building, which was formerly the Municipal Annexe on the corner of Sir Thomas and Dale Street, will be unique to the city. It offers unrivalled grandeur from when it was first constructed in 1865 and will retain its architecturally significant features when it opens. 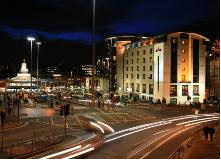 The Holiday Inn City Centre is the most centrally located hotel in Liverpool situated directly opposite Lime Street main line train station for visitors travelling from all area’s of the UK and a bus link to Liverpool John Lennon Airport stops leaves the station every 20 minutes. Discounted rates of Â£5.00 per 24 hours are available at the adjoining Euro car-park which has 1000 spaces. The Holiday Inn is perfectly located which ever way you or your delegates choose to arrive in the city. Located just a stone’s throw away from Liverpool’s historic and vibrant waterfront, the luxurious boutique Hotel Indigo Liverpool is unique and designed to reflect the local culture, character and geography of the surrounding area while the brand hallmarks of being part of the Intercontinental Hotels Group (IHG) ensure consistent and reliable services. Within the heart of the Centre and within easy walk to ACC Liverpool & BT Convention Centre & Novotel Liverpool Centre is ideally located next to new Liverpool One (L1) and short walk to the famous Albert Dock and waterfront. Radisson Blu Hotel Liverpool is a four star hotel with excellent access from all motorways, Liverpool John Lennon Airport and Liverpool Lime Street Station. 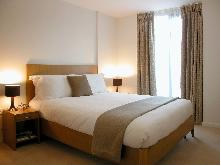 The Richmond, is one of Liverpool City Centre’s newest most luxurious four star accommodation provider, situated in the “up and coming” Hatton Garden (400m from Lime Street Station).